The U.S. Department of Agriculture recommends that healthy adult men and women should consume 1 1/2 to 2 cups of fruit every day. Eating 1 cup of sliced fresh or frozen strawberries helps you fulfill up to half of this requirement. Each cup of fresh strawberries has 53 calories, with approximately 51 calories supplied by carbohydrates. A 1-cup serving of sliced strawberries contains 12.7 grams of carbohydrates. The Dietary Guidelines for Americans advises that adults should aim to get 45 to 65 percent of their total daily caloric intake from carbohydrates; which, for a person on a 2,000-calorie diet, is equivalent to approximately 225 to 325 grams of carbohydrates per day. A serving of strawberries fulfills between 3.9 and 5.6 percent of an adult's carbohydrate requirement. 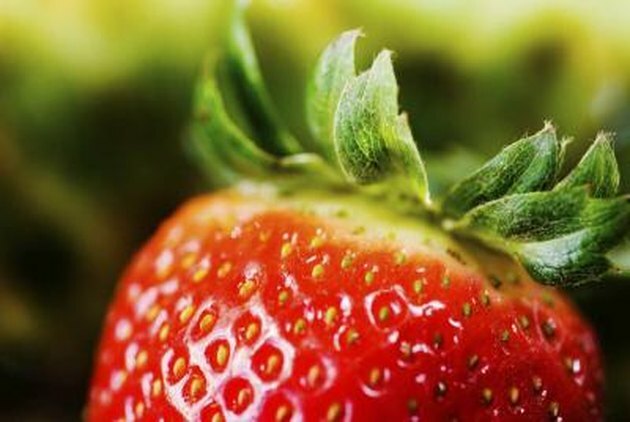 Of the total carbohydrate amount in a serving of strawberries, 3.3 grams are supplied by dietary fiber. If you're a man, this amount supplies about 9.7 percent of the amount of fiber you should consume each day. Each cup of strawberries fulfills about 11 percent of the amount a woman needs per day. Strawberries are rich in both soluble and insoluble fiber. A diet that contains plenty of each is linked to a lower risk of digestive problems, diabetes and high blood cholesterol. Approximately 8 grams of the carbohydrates in each 1-cup serving of strawberries is supplied by simple sugars, which include 4 grams of fructose, about 3 grams of glucose and nearly 1 gram of sucrose. Simple sugars -- also known as simple carbohydrates -- are your body's primary source of quick energy, says the Centers for Disease Control and Prevention. If you use frozen strawberries, avoid sweetened brands since they are high in refined sugar, which provides calories but no nutritional benefit. If you're following a low-carbohydrate diet, you are probably keeping track of your net carbohydrate intake instead of counting grams of total carbohydrate. To calculate this amount in a serving of food, subtract the grams of fiber from the total grams of carbohydrate. A 1-cup serving of sliced strawberries has a net carbohydrate count of 9.4 grams. This amount represents the grams of carbohydrates that have a direct effect on your blood sugar level, says Atkins.com. United States Department of Agriculture: ChooseMyPlate.gov: How Much Fruit Is Needed Daily? United States Department of Agriculture: ChooseMyPlate.gov: What Counts as a Cup of Fruit? Atkins.com: What Are Net Carbs? How Can Strawberries Affect Your Bowels?